A somewhat naive understanding of human evolution and individual development assumes that with each advancing stage, former ones are simply outgrown and left behind. We know, however, that this is not how nature evolves. Earlier and more primitive structures are not abandoned, and neither do they merely lie inert beneath the exciting progress higher up. Instead they get incorporated into the emerging design, differently managed or re-purposed in light of a greater functional complexity. This matters a lot when it comes to the interpretations of our own progress as individuals and a species. The naive approach has treated our mythological past, for instance, as over and done, leaving us free to face reality (finally!) as it is. Scientific theories relentlessly pursue objective truth, while the ancient myths may entertain us but in the end only obfuscate our view of what’s real. We need more facts, not superstition. The presumption is that our ancestors and other distant cultures stumbled around in ignorance, whereas we now clearly see the way things really are. A closer look reveals that earlier versions of ourselves – whether bygone generations or former decades in our own lifetime – continue to operate underneath and behind whatever ‘executive functions’ are currently at the helm. In developmental psychology we commonly speak of our ‘inner child’ which refers to an infantile and juvenile subpersonality (Assagioli) that sometimes takes over when we’re tired, sick, hungry, stressed, or threatened. But we should also take into account a still more primal animal nature that lurks in the unconscious and is governed by instinct. These deeper and developmentally earlier versions may not determine our engagement with reality as they once did, but a mature adult must learn how to incorporate ‘gut feelings’ and playful spontaneity in a more socially responsible way of life. Most likely our biggest limitation has to do with the fact that each advancing stage in development reconnects us with reality in a new way. Or we might say that each stage in development initiates a shift in reality itself, for the straightforward reason that our mode of engagement with reality must be included in what is meant by the term. Along the path of human evolution, then, our species has confronted a new reality at each turn. And across the arc of our evolution these developmental advances have carried forward former versions of ourselves, still operating at deeper and less conscious levels. I propose that human beings have evolved through three major ‘reality shifts’ and that we are currently on the cusp of a fourth. This is similar to the well-known ‘paradigm shift’ concept made popular from the history of science (T. Kuhn), except that as a constructivist – maybe even a radical constructivist – I want to make it about more than a mere shift in the (mental) “framework containing the basic assumptions, ways of thinking, and methodology that are commonly accepted by members of a scientific [or other type of] community” (Paradigm in Dictionary.com). When our framework shifts, everything about our way of engaging with reality also shifts, which means that because reality necessarily includes our way of engaging it, reality itself shifts as well. The first reality shift, and the one that launched our species on its cultural trajectory, is what I’ll call the mythopoetic. Poiein is Greek for ‘to make’, and mythos translates as ‘a narrative plot’ or story; so a mythopoetic reality is one where our engagement with existence is facilitated by the narrative construction of stories. I don’t agree with a popular definition of myth which dismisses it as ‘primitive science’, our first bumbling attempts to explain what’s going on around us in the natural world. Rather, myths articulate and embellish upon foundational metaphors that represent our deepest impressions and intuitions of the grounding mystery, or what I also call the provident ground of being itself. It’s important to understand that a story-shaped reality has no ‘outside’ – no nonfictional or purely factual realm independent of the mythic imagination. This reality is sustained in the activity of narrative performances where stories are acted out in the tasks of daily life, with the turn of seasons, on special occasions, and around the shared concerns of a community. Whatever may lie beyond the boundaries of a particular story-world is not a ‘mere fact’ but is characterized according to its proximity and potential value to what’s going on inside the story – such as the chaos acknowledged in many ancient myths, dragons lurking at the edges of medieval maps, or the boogeyman in a child’s closet. As that last example suggests, early childhood is when each of us lived in a mythopoetic reality. We were continuously pretending – daydreaming, fantasizing, dressing up, role-playing, embarking on one adventure after another. In those years we had no interest in, let alone an understanding of, the factual reality that would later become the bedrock truth of our adult experience. That time in our lives – whatever we can remember of it – is probably our best entry to an understanding of what prehistoric story-telling culture was like. At some point in the evolutionary past, as well as in our own personal past, the sacred canopy of mythopoetic reality came down – or at least fell just far enough to expose another reality on the other side of our stories. I will call this the shift to historical reality, a shift reflecting the progress of human consciousness beyond the security, meaning, and hope we had earlier found in our myths. For a memory of what it was like, we need to recall that strange mixture of exhilaration and anxiety we felt in adolescence. The exhilaration came as our perception of time expanded beyond the ‘once upon a time’ and ‘happily ever after’ frame of the story-world, into a causal stream seemingly without beginning or end. As the boundary of our mythopoetic reality blew open to reveal a limitless field of possibilities, the opportunity as well as temptation for all things exotic beckoned to us. On the other side of that exhilaration, however, was an anxiety over our sudden ‘nakedness’ – a niggling self-conscious sense of being stared at. Both of these powerful moods (exhilaration and anxiety) announced the emergence of a separate center of personal identity, or ego. This separate self provided a new vantage point on a reality without limits (except for those repressive rules imposed on us by authorities), arranged and revolving around ego at its fixed center. It is in this reality and corresponding version of ourselves that an irresistible impulse to throw off constraints and ‘become as the gods’ – free, powerful, and beyond accountability – acquired the drag of guilt and shame for our offense. You should be able to hear a strong theistic theme here, which resolved the problem of separation by a process of atonement and reconciliation. The dawn of historical consciousness is accompanied by a disenchantment with the mythopoetic reality of early life, which comes as a consequence of ego’s separation from its own grounding mystery. Whereas the mythic imagination continues to operate farther below, the executive ego – or what I also name Captain Ego – is having to take into account a factual realm altogether independent of it. This forces upon ego a need to decide the truth status of those stories, and a few alternatives become obvious. One answer is that the myths are simple stories of an era when we believed such things. Now we know better and should dispense with them in the interest of progress. A second option, related to the first, might regard the myths as amusing tales that provide a fascinating look inside a less enlightened period. Another possibility is that myths are descriptive reports of miraculous events and supernatural things revealed in the far-distant past and recorded for our benefit, but of events and things not presently accessible to our senses. This is the option that led to converting the literary (or mythological) god into a literal being, and invented the idea of a supernatural realm above and outside historical reality. Finally, a fourth answer to the question ‘wherefore the myths?’ would be to explore them as metaphorical clues to our deeper spiritual life. Of the four options, this one is by far the least popular; ego has a hard time with metaphors and anything deeper than its own personality. The doctrine of personal immortality, another invention of this reality shift, dismisses all notions of a spirituality that threatens to swallow up, go beyond, or dissolve away the permanent self. The shift to a secular reality came about as the inherited system of supernaturally oriented beliefs rapidly lost relevance to the challenges and opportunities of daily life. This coincides with a shift in consciousness from the insecure and self-conscious ego to a more ’embodied’ and this-worldly (Latin saeculāris) orientation. Such an orientation, while portending the end of supernatural religion and biblical literalists (option 3 above) everywhere, is energetically embraced by many atheists and mystics alike. ‘Humanist’ is probably the best term for describing the emerging value system of this reality shift, as the larger cause for human rights, individual happiness, and personal well-being informs and qualifies more of what we do. The weight and promise of our current situation calls for a clear view of the facts and a more broad-based social responsibility. We don’t look outside the world to a supernatural heaven, an end-time deliverance, or even a metaphysical underground to which we might escape the task before us. The resources and solutions we’re looking for must be found inside – within ourselves, our communities, and in our shared world – this world. As odd as it sounds, the shift from historical to secular reality makes possible a renewed appreciation for life’s sacredness and what I call the Real Presence of mystery. A reverence for the earth’s elemental forces and exquisite beauties, for the fragile yet tenacious life-force evident all around, a reverence which had been intrinsic to the enchantment of mythopoetic consciousness but was later eclipsed by the rise of the historical ego, returns now, but in a consciousness that better understands its creative responsibility within the whole. Such a heightened sensitivity to the value and promise of what’s inside awakens empathy, inspires compassion, motivates cooperation, and reconciles consciousness to a reality that is more interconnected. As we better understand the nature of systems and our own place in the ecosystem of planet Earth, reality invites our engagement at a new level. Of course, we’ve always belonged to systems, but as consciousness opens up to our responsibilities and creative authority within the systems we inhabit, a new set of values begins to guide our choices, goals, and commitments. Living in a global reality doesn’t allow us to make decisions and take action only around individual self-interest, or even that of our local tribes. Consequences flow out in waves of rippling influence, not by the linear cause-and-effect of billiard balls. What’s more, the most serious consequences come back on us by intricate feedback loops, slow amplification, and long delays that we cannot predict or control. But when they come, everything in the system is affected. Perhaps the most obvious example of this seeming ‘suddenness’ of catastrophic consequences is the phenomenon of global warming. The buildup of so-called greenhouse gases has been on a slow rise for many decades. But now, all of a sudden, polar ice caps are melting at an alarming rate and sea levels are rising, entire species are going extinct, and convoluted weather systems are bringing upon us one disaster after another. 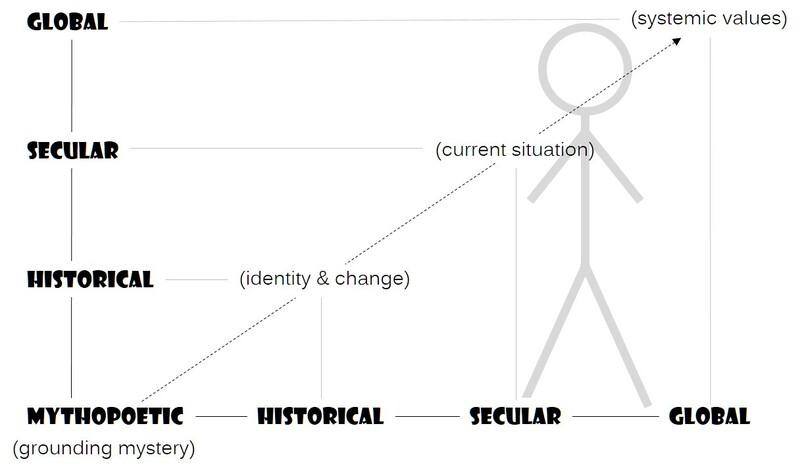 In my diagram above I have positioned a human stick figure with one foot in secular reality, and the other in global reality – or almost there. This is to make the point that, for the most part, our species is only beginning to grasp the bigger picture, deeper truth, and longer view of our place in the universe. We may hold this intuition in our mythic imagination, but it remains buried beneath an obsession with identity (ego) and a chauvinistic secular humanism. Even now, any incentive for altering routines and convictions must appeal to a concern for ourselves and future generations, rather than a genuine reverence for life and responsibility to the whole. Global reality is where the evolution of consciousness has reached a point of the universe becoming aware of itself – in us. Instead of this higher awareness setting us apart from the other species, its aim is to inspire us to care more responsibly for the planetary community of life.